Effective risk assessment is implicit in all current Health & Safety legislation and forms an essential part of overall risk management. VET Providers and Teachers are required to carry out an initial risk assessment to ensure the safety and well-being of each student on placement. The risk assessment must be completed and made accessible to Students, VET Providers, Teachers and Employer so all partner’s area aware of the risks. 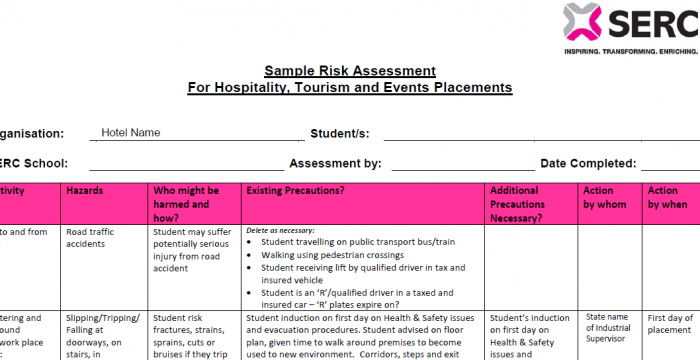 The risk assessment template would need adapted for each student on placement with respect to their age, experience, maturity, job role, health etc. (information is collated from the Placement Partnership Agreement).